It’s post 300! Never thought I’d see the day… to celebrate the fact that I’ve been churning out so many posts here at spalanz.com, I’ve decided to go for a fairly special post to mark the occasion, and bring you all a game day blog that takes a look at a game that has been mentioned here so often, it’s gotten a little silly: it’s time for Descent! Yes, ladies and gentlemen, today I’m looking at the juggernaut of dungeon-crawling games, designed by Kevin Wilson and originally released from Fantasy Flight Games back in 2005. Set in the fantasy world of Terrinoth, the game features a one-vs-many mechanic, pitting a group of heroes against the evil Overlord. It was released in a second edition in 2012, and being a huge fan of the Realms of Terrinoth, I snapped it up! 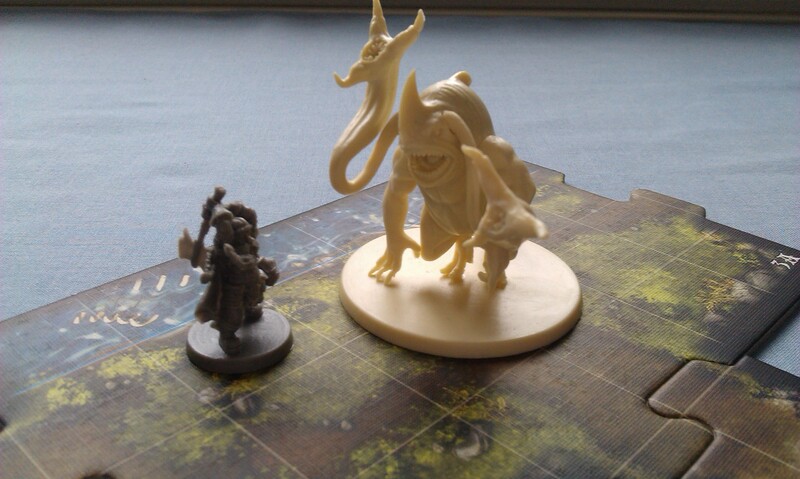 While it has seen depressingly little table-time from me, a spate of co-operative adventures has since been released that supports solo play for the game, and has allowed me to enjoy the game at last! First of all, the heroes. There are eight heroes in the base game, sub-divided into four archetypes – warrior (red), healer (blue), mage (yellow) and scout (green). Each of these is further subdivided into classes, with each archetype receiving two such classes in the base game. Each class has its own deck of small cards, which provide the hero with some starting items and abilities, as well as skills that can be bought by leveling up your hero. Always fantastic when a game allows this! Lieutenant packs feature plastic miniatures instead of the cardboard tokens used to represent Lieutenants in the game. As usual with FFG, however, they’re much more than just a new figure. They also come with a Plot deck that adds an extra level of storytelling for the Overlord, a deck of cards that is paid for with threat tokens that are gained whenever the Overlord defeats heroes, completing quests, etc. However, threat tokens, when paid, are given to the heroes as Fortune tokens, which can be used by them to re-roll dice and stuff. It can be a powerful trade-off! Also included is an Overlord card that allows you to bring that Lieutenant into any game as an Agent, replacing one monster group with a version of the Lieutenant that is somewhere between full Lieutenant and Monster. There are loads of Lieutenant packs out now, and they’re all very much worth it for the range of options they bring to the game! The game follows a specific scenario, and supports a campaign-mode of play whereby scenarios can be linked to form a real adventure, and character-leveling becomes more important as the game goes on! 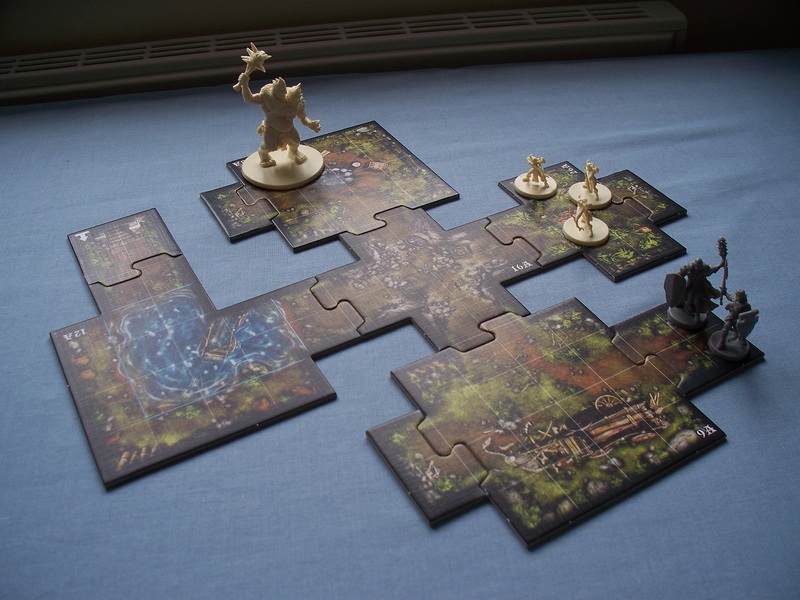 There is a campaign book included in the game that details how each scenario is set up, using specific tiles and monsters, as well as other tokens to represent items or search opportunities for the heroes. 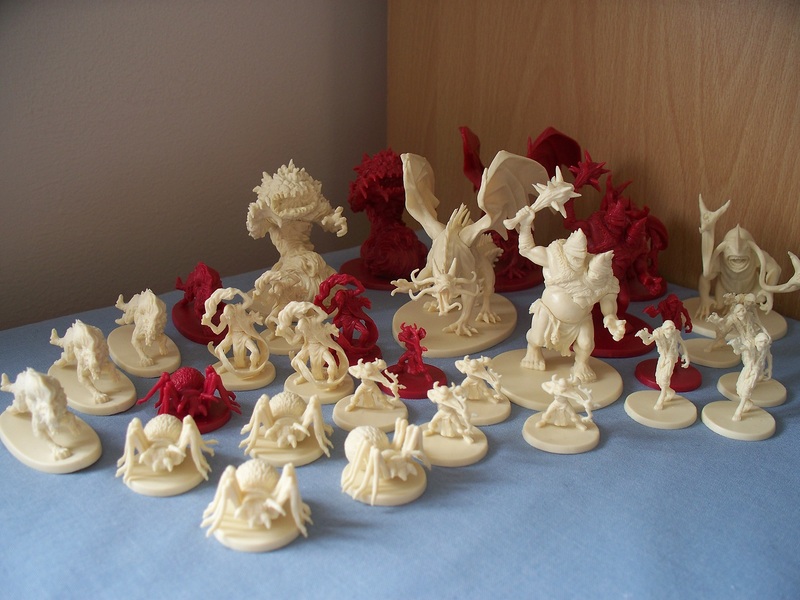 The Overlord, as mentioned, has access to a fairly decent collection of monsters here, but there are also Hero and Monster Collections available that re-implement classic monsters from the first edition of the game, in new sculpts that look pretty awesome! I’ve looked at those elsewhere on this blog, of course, so let’s stick with the base game for now! While the game is scenario-driven, combat forms a main part of the experience, and the system used by Descent is actually really nice, I think! 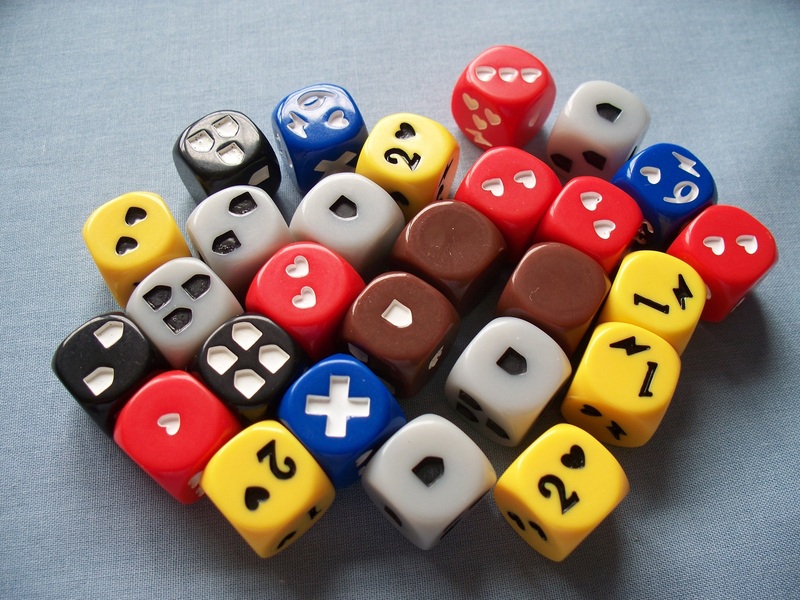 To start with, there are a whole load of weird-looking six-sided dice for the game, which have all manner of symbols on them to indicate successes and failures. Here, Grisban the Thirsty has rolled three hits (with a range of 6, but as this is a melee attack the range doesn’t count) against the Merriod, and has one surge that he can spend to trigger the effect on his Chipped Greataxe to deal an additional wound; the Merriod can cancel two of these, so will take two damage from this attack. 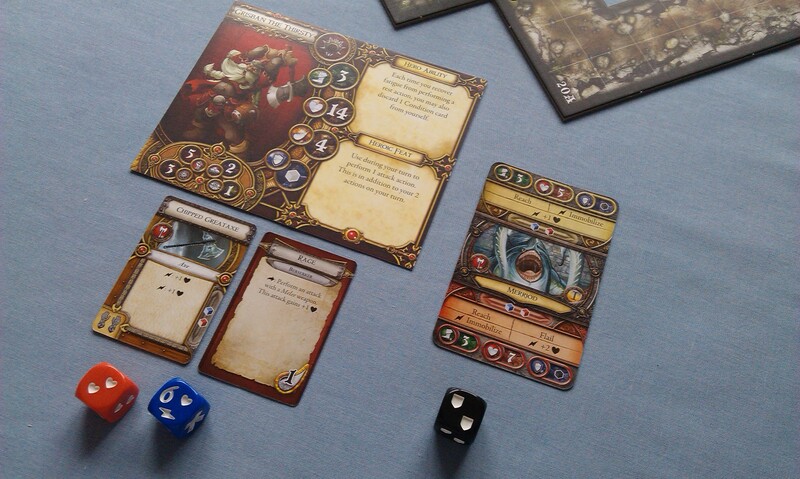 The number of dice a hero or monster rolls are shown on the respective cards – monsters have cubes above the picture (for a generic, cream-coloured monster) and below (for the red, master monster), while item cards will show the coloured cubes on the right border. Item cards often have a hand limit, similar to Arkham Horror – Grisban’s axe in the above picture has two hands in the bottom-left corner, so he can’t use any other items in his attack. There is a lot of depth to Descent that I’m not really getting across in this blog, for the simple reason that it’s a game you really need to play in order to truly experience. It can be quite complex to get everything moving, as evidenced by the 36-minute Watch It Played video, but the experience can be exceptionally rewarding for both sides when you do it right. That said, it’s not the sort of game I tend to go for (despite owning the fairly-similar Mansions of Madness), and the Overlord is much more the antagonist rather than more a DM, but it’s still got so much to commend it that I can never stop gushing about it whenever I get to play!